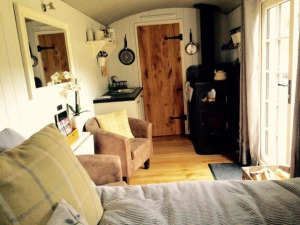 Mid Wales Luxury Shepherd's Huts01650 511579work GlampingCut Sinc, Cut Béch & Cut Mawr are newly built and lovingly handcrafted shepherd's huts, built to the highest specification. Enjoy a wealth of wildlife from your own environmentally friendly off-grid shepherd’s huts. Both huts are set in their own unique individual locations on our farm. The perfect ‘get away from it all’ romantic eco-retreat! Comfortable, quiet and peaceful! There are plenty of activities and attractions to stimulate the adventurous and relax the work-worn. Set amongst acres of farm land and on the ‘Glyndwr’s Way’, Cut Sinc, Cut Béch & Cut Mawr are an ideal base for couples or individuals to explore one of the most picturesque parts of Mid-Wales, a haven for walkers, bird-watchers and cyclists. Our huts are completely self-contained, everything you'll need is all under one roof, with a state of the art eco-loo and a hot shower. Environmentally friendly and ‘off grid’ they are powered by solar panels. There is enough energy made to power the lights, and charge your mobile phone and laptop (USB). And there is also a cosy wood-burning stove for those chilly nights, and a gas BBQ on the decking! All bedding, towels and a starter pack of logs for the wood-burner are provided. Your furry family members are welcome, but must adhere to the countryside code. 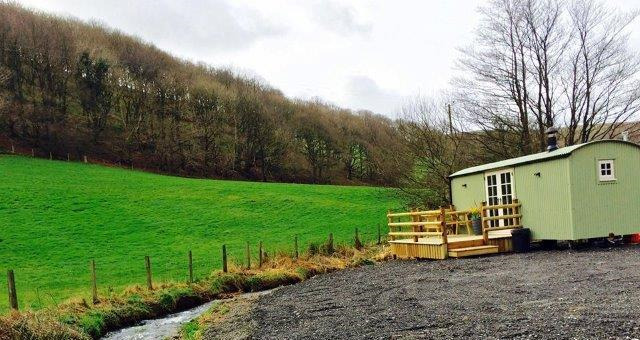 A Warm Welsh Welcome awaits you at our new luxury Shepherd’s Huts! Mae Croeso Cynnes Cymreig yn eich aros yn y Cut Sinc a'r Cut Béch! The grid shows the prices and daily availability from Thu 25 Apr 19 to Thu 2 May 19. It's easy to check availability for particular dates; just use the calendar to choose the check in date, select the number of nights and click the 'Search' button. Click the Book Now or Book Direct button to book the highlighted days. With Book Now the unit booking will be confirmed immediately, with Book Direct the unit reservation will be confirmed within 24 hours..
Cut Sinc, Cut Béch & Cut Mawr are newly built and lovingly handcrafted shepherd's huts, built to the highest specification. Children welcome from age 2. We will send directions a few days before your arrival.